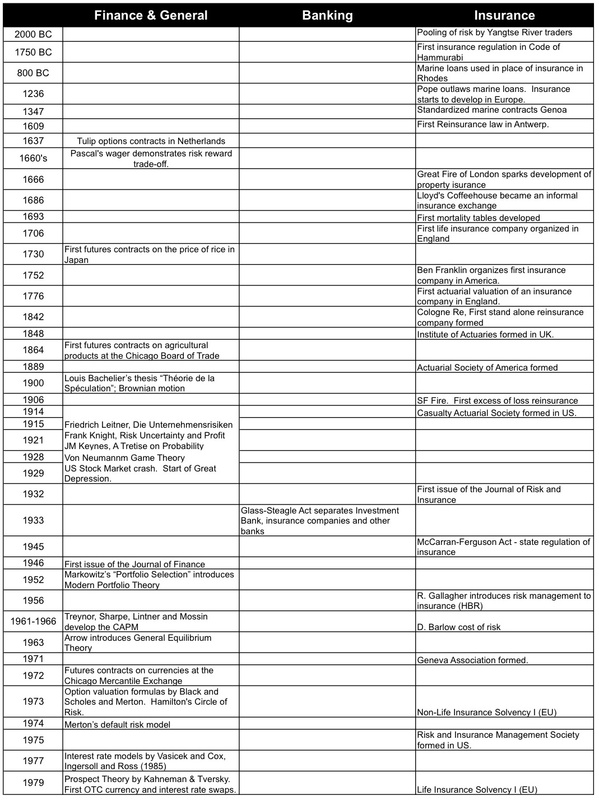 The following is a very incomplete outline of risk management history. Most of these items were found on the internet. So you can use this as a source for search terms. 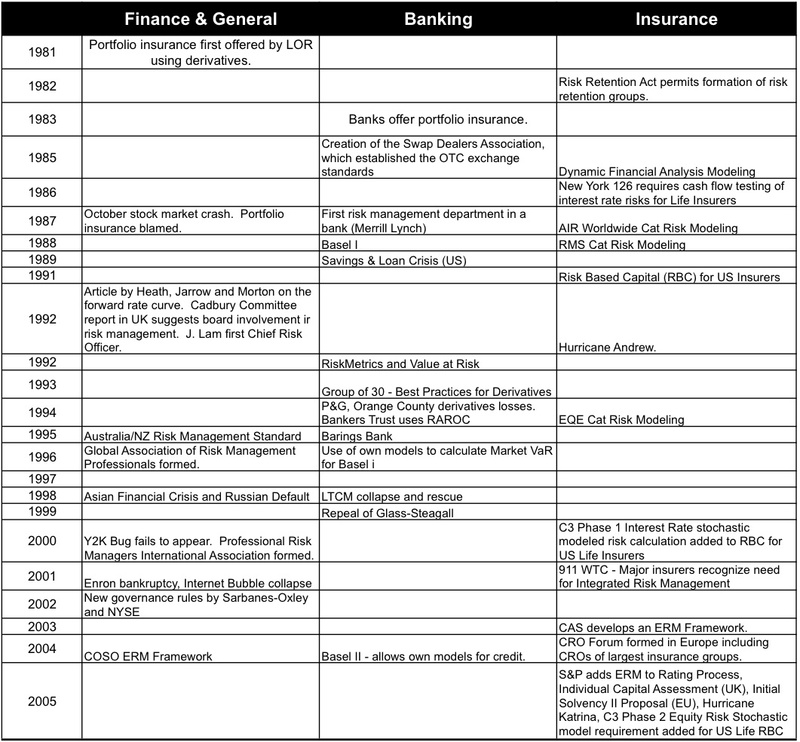 Riskviews has some additional historical material about the Global Financial Crisis. Risk management doubtless started earlier than 2000 BC. The initial item cited below is the earliest record of risk management. This first panel includes activities that develop the intellectual basis for risk management. Sometime around 1980, the theories about risk started to be applied in a big way, especially in banks. Each new wave of activity eventually led to a blow-up, but everyone tried to learn from the mistakes and incorporate those learnings into common risk management practices and it eventually led to the development of Enterprise Risk Management and the apparent mastery of risk. The mastery of risk was actually a drastic overstatement. The best practices were often given only lip service and extremely large risk positions were allowed to be built up in financial institutions around the globe. There was a bubble in risk and like all bubbles, it eventually burst. Regulators and institutions are all again seeking risk mastery. We shall see what emerges. The 17th century was a period of extraordinary advances in mathematics in Germany, France, and England. At the same time there was a rapidly growing desire and need to place the valuation of personal risk on a more scientific basis. Independently from each other, compound interest was studied and probability theory emerged as a well understood mathematical discipline. Another important advance came in 1662 from a London draper named John Graunt, who showed that there were predictable patterns of longevity and death in a defined group, or cohort, of people, despite the uncertainty about the future longevity or mortality of any one individual person. This study became the basis for the original life table. It was now possible to set up an insurance scheme to provide life insurance or pensions for a group of people, and to calculate with some degree of accuracy how much each person in the group should contribute to a common fund assumed to earn a fixed rate of interest. The first person to demonstrate publicly how this could be done was Edmond Halley. In addition to constructing his own life table, Halley demonstrated a method of using his life table to calculate the premium someone of a given age should pay to purchase a life-annuity (Halley 1693). James Dodson’s pioneering work on the level premium system led to the formation of the Society for Equitable Assurances on Lives and Survivorship (now commonly known as Equitable Life) in London in 1762.. This was the first life insurance company to use premium rates which were calculated scientifically for long-term life policies, using Dodson’s work. The company still exists, though it has run into difficulties recently. After Dodson’s death in 1757, Edward Rowe Mores took over the leadership of the group that eventually became the Society for Equitable Assurances in 1762. It was he who specified that the chief official should be called an ‘actuary’ (Ogborn 1956, p. 235). Previously, the use of the term had been restricted to an official who recorded the decisions, or ‘acts’, of ecclesiastical courts, in ancient times originally the secretary of the Roman senate, responsible for compiling the Acta Senatus (Ogborn 1956, p. 233). Other companies which did not originally use such mathematical and scientific methods most often failed or were forced to adopt the methods pioneered by Equitable (Bühlmann 1997, p. 166). Suggestions for additions are welcome. Please put in a comment. Eventually the panels will be updated to incorporate good suggestions.